Great News. 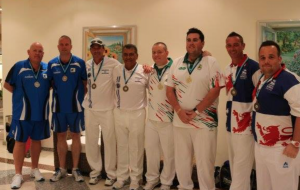 Earlier today Ireland’s gents won two medals at the Atlantic Rim Championships. Gary Kelly and Ian McClure won a gold medal in the pairs and Aaron Tennant, Neil Mulholland and Marty McHugh won a bronze in the Triples being pipped at the post in a tie end in their semi-final. This is a fantastic achievement in the first week of a two-week event. Not to be outdone the ladies triple of Erin Smith, Bernie O’Neill and Sandra Bailie also won gold in winning the Ladies triples. Not a bad days work!!. Two Gold and one bronze medal. Now on to next week and the quest for more medals. The Singles and Fours are up for grabs now. All the best to all our players Gents and ladies.